A 4-year-old Georgia girl with a voracious appetite for reading was given a chance to be “Librarian For the Day” at the Library of Congress this week. Daliyah Marie Arana of Gainesville, Ga., has read more than 1,000 books, the Gainesville Times reports. The four-year-old roamed the hallways with Carla Hayden, the 14th Librarian of Congress, who tweeted photos of Daliyah sitting in her desk. Daliyah’s mother told the the Gainesville Times, that her daughter joined Georgia’s “1,000 Books Before Kindergarten,” almost two years ago and started paving her way through books. Haleema Arana told the Washington Post, that her daughter was invited to spend the day with Hayden after she reached out to see if there was any way to enhance Daliyah's experience at the library. “She just kept saying how the Library of Congress is her most favorite, favorite, favorite library in the whole wide world,” Haleema Arana told the Washington Post. 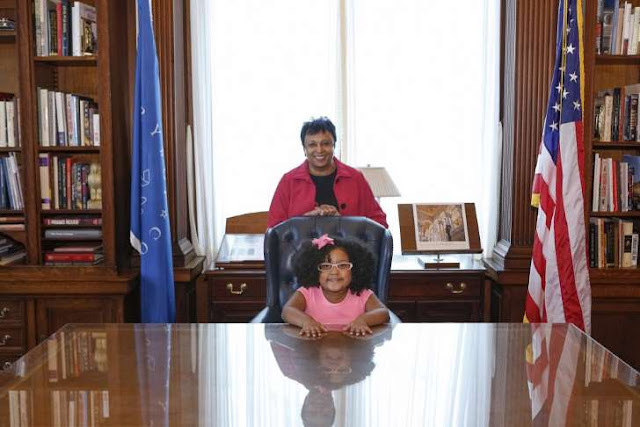 © @LibnOfCongress via Twitter Librarian of Congress, Carla Hayden, and 4-year-old Daliyah Marie Arana of Gainesville, GA as "Librarian For The Day." Before Daliyah Marie Arana was even born, her parents say, she was learning how to read. While she was pregnant with Daliyah, her mother would read books to her other young children on a daily basis. When Daliyah was an infant, she would hear her older brother reading chapters of books out loud in their Gainesville, Ga., home. And by the time she was about 18 months old, she was recognizing the words in the books her mother read her. So it was no surprise when, at 2 years and 11 months — the age that most children barely understand the concept that text carries a message — Daliyah read her first book on her own. Now 4 years old, Daliyah has read more than 1,000 books and has managed to read certain college-level texts. And the preschooler’s skilled reading and passion for literature impressed even the leader of the nation’s library, Carla Hayden, the 14th Librarian of Congress. On Wednesday, Hayden hosted Daliyah at the Library of Congress, giving the 4-year-old a chance to shadow her as “librarian for the day.” Wearing her glasses, pink dress and matching pink bow, Daliyah walked the sprawling hallways of the world’s largest library and sat in on executive roundtable meetings — as any high-profile librarian would do. Hayden, who made history this year as she became the first woman and the first African American to run the nation’s library, tweeted photos of Daliyah’s visit from the library’s official account. One showed Hayden and Daliyah walking precisely in step, both holding their hands behind their backs, with Daliyah looking up at Hayden with eyes of wonder. Of course, the young bookworm is no newcomer to libraries. As she told the Gainesville Times, Daliyah has her own library card, and is a regular at her local library, the Hall County Library in Gainesville. “I like to check out books every day,” Daliyah said. “And I want to teach other kids to read at an early age, too,” Daliyah told the Gainesville Times. Through the 1,000 Books Before Kindergarten program, Haleema Arana got the idea to start counting the number of books Daliyah read. She was about 3 years old at the time, and had likely already read about 1,000 books with the help of her mother. In the year or so since, Daliyah has met the program’s 1,000-book goal, and aims to reach 1,500 by the time she enters kindergarten next fall, when she hopes to “help the teacher teach the other kids how to read,” her mother said. To give her a challenge — and to cater to her love of books — her mom gave her a college-level text, a speech called “The Pleasure of Books” by William L Phelps. Daliyah learned to read the speech so well, pronouncing words such as “punctiliousness” and phrases like “annihilates formality,” that her mother posted a video of her reading it on YouTube. Her mother hoped that by posting the video, she could encourage other parents to teach their children how to read at a young age, she said. Exposing her children to books from infancy has made all the difference, Haleema Arana said. “She’s able to just absorb so much and retain so much so fast,” Haleema Arana said. Daliyah’s vocabulary and reading comprehension has perhaps also benefited from her bilingual home — her father, Miguel Arana, is Mexican, and often speaks to Daliyah in Spanish. Although the 4-year-old cannot yet speak the language fluently, she can understand many words and hopes to work toward learning how to read in Spanish, her parents said. The avid reader has already gained recognition in her home town, serving as a “librarian for a day” at the local library and even being asked to recite the famous “I Have a Dream” speech at an upcoming Martin Luther King Jr. Day celebration. Her mother decided to reach out to the Library of Congress to see if she could take her daughter’s “librarian” experience to a new level. The library responded, inviting the family to spend the day with Hayden. As she toured the children’s section of the library Wednesday, Daliyah read books to Hayden and met other members of the library staff. When they asked the 4-year-old librarian for recommendations, an idea immediately came to her mind. She suggested they install whiteboards in the library hallways, so that children like her can practice writing on them. Daliyah Marie Arana is putting her ABC knowledge to good use. The 4-year-old Georgia toddler has reportedly read over 1,000 books since she first started picking them up two years ago. The Gainesville Academy pre-schooler recently finished the Georgia 1,000 Books B4 Kindergarten Program set in place to acclimate young students with books and literacy, and asks them to attempt to read 1,000 books before the first day of kindergarten. Arana completed the big-read challenge before she began preschool. Arana’s parents told the Gainesville paper that they began reading to their baby right when she was born. Arana impresses viewers with a wonderful YouTube video of her reading a college-level speech entitled “The Pleasure of Books,” by William Lyon Phelps. Arana’s favorite author is Mo Willems, who focuses on content for pre-K through third-grade students. Arana and her family often visit the Hall County Library’s Gainesville branch. Arana is even the proud owner of a library card. Her latest ambition: to become a librarian. Haleema Arana says that she’d like 1,000 new children to sign up for library cards; this equates to the same number of books the brainy 4-year-old has already completed. 0 Response to "This 4-year-old has already read 1,000 books"